I wish I could remember who said it, but someone said that getting published was more about quantity then anything else. The more article proposals you send out the more likely you are to be published. Yes, the chance of getting rejected is higher as well, but the successes more than make up for the rejections when the ratio is 3:1 or greater. I still have a lot of art out there that I haven't heard about, and had a few things rejected this year, but I feel really really good about how many successes I've had. So now that I've seen how important having one really major goal for a year is, I'm wondering what should I make my 2012 goal. How about you? What's your goal for the next year? I'm a big believer that if you even whisper it to yourself, saying it out loud makes you more committed to achieving it. So say it to yourself, or share it here, it doesn't matter. Just do it! 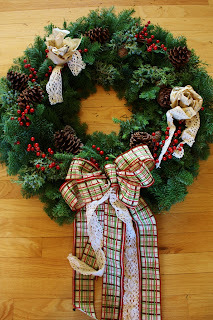 One Basic Wreath- So Many Different Ways to Be Creative! 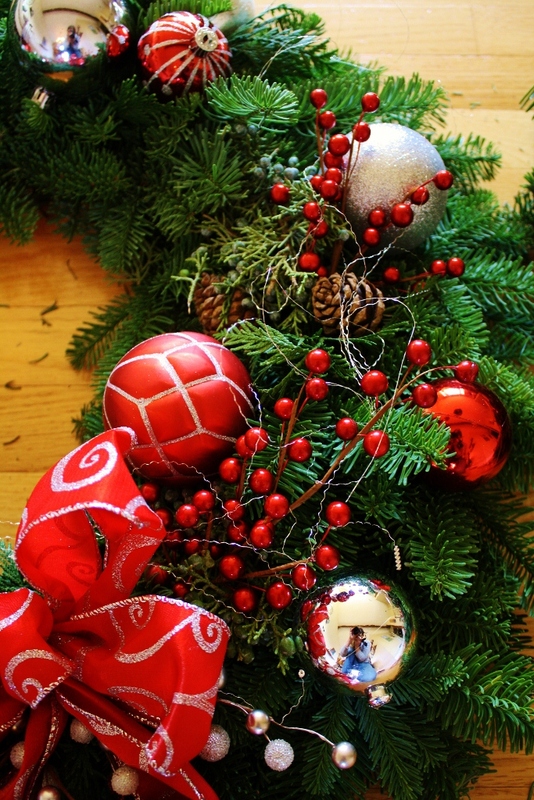 *For ornaments I favor the shatterproof one's available from the major home improvement stores. I bought a 100+ selection of Martha Stewart ornaments that came in a big plastic barrel. They do sell them in smaller assortments, I was buying for 25+ women so the mega size was perfect. 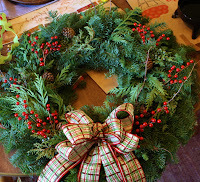 Because I'm buying in bulk I like to hit the craft stores for basic fillers like the berries and for assorted ribbon. I could go wholesale but most retail stores are selling Christmas supplies at 50% off right now. It actually works out to be cheaper.The hot glue I do buy at a Floral wholesaler. I have a glue pan that I love from Oasis and I buy bags of floral glue each year. Floral hot glue looks like little yellow pillows vs. the stick form that you buy for your glue gun. 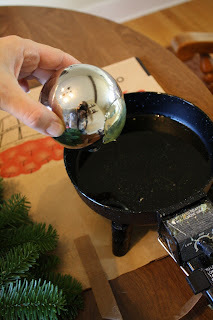 The benefit of the floral type is that it's fabulously quick and easy to dip ornaments, sticks, pine cones, or whatever in the glue pan. It's dip and stick- that's it. Floral glue is also formulated to not break when it gets cold, so it's nice to use around here where temps can dip pretty low. 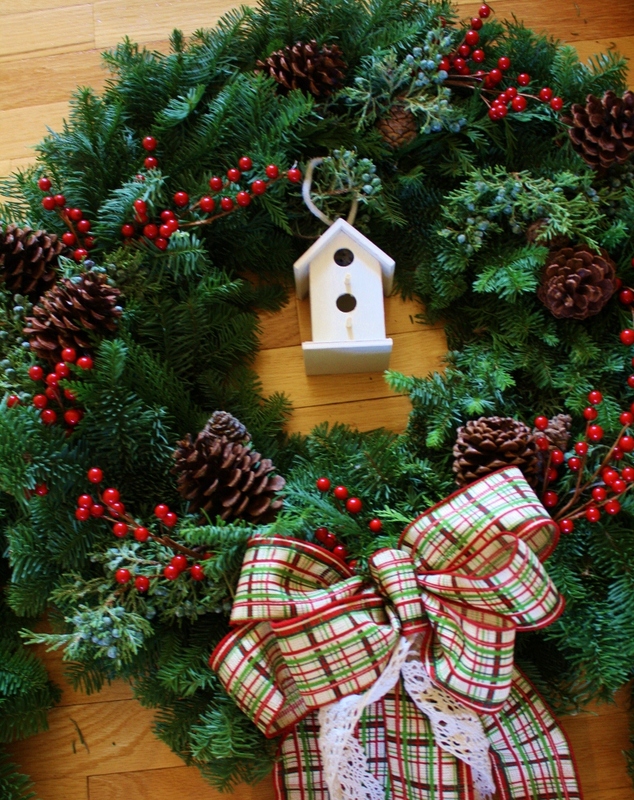 If you don't want to use glue at all you can usually wire in any decorative elements. 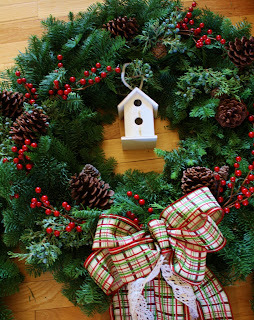 ALWAYS FLUFF YOUR WREATH!!!! 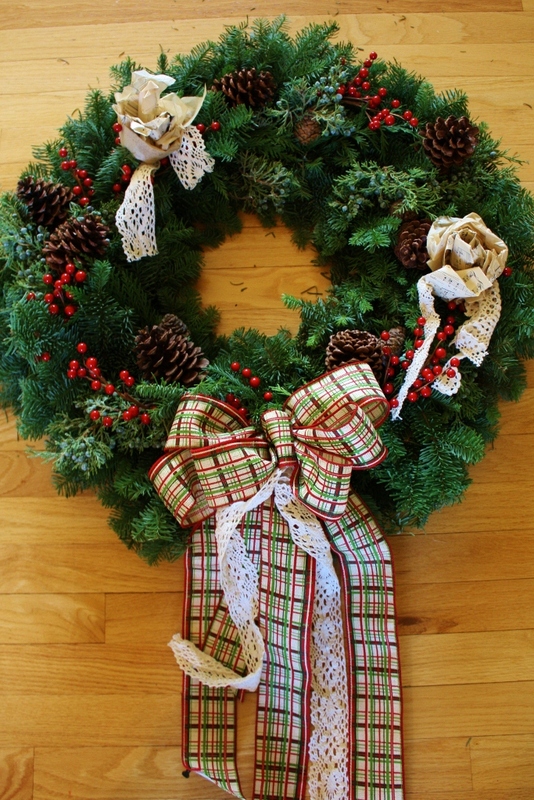 What I mean is that since wreaths are shipped lying flat they are usually very, very, flat when you get them. 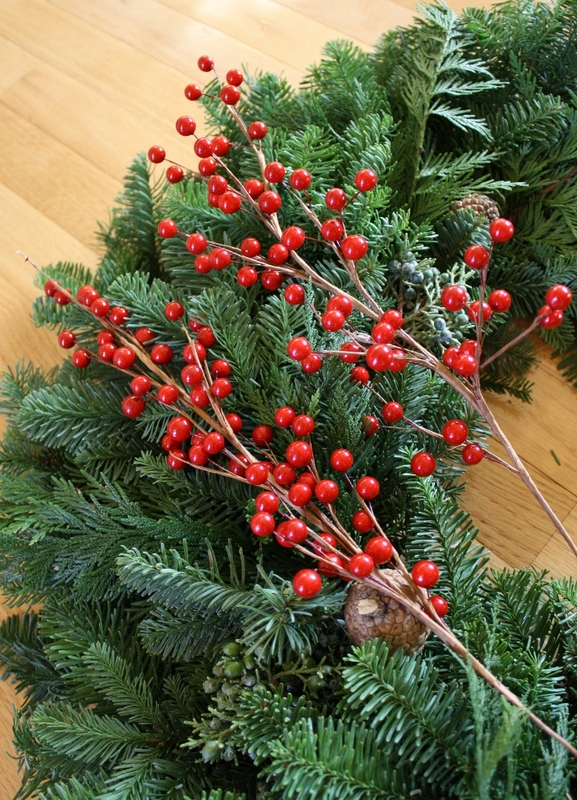 Always take your fingers and rake them through the wreath in the opposite direction of how they're attached. Lift and shake the greens as you pull them back a bit and you'll see a huge difference immediately- I promise! One more related tips is to always work your wire berry sprays by bending the wire into a more natural curve. Here's a pic of two sprays, the one on the left is how it comes in the store. The one on the right has been bent into a more natural spray form. There's a definite difference. BE CREATIVE with your Embellishments!!!! My son's class had their Thanksgiving party last Friday. I usually make sure I have a corner on doing the craft project. I love coming up with something that the kids enjoy, that is meaningful, and won't get surreptitiously tossed in the recycling the next day. I usually try to wrap into it some sort of material or technique that I'm interested in right then as well. So the project I designed this year was a table runner. Each kid got a rectangular piece of canvas (roughly the size of a place mat and a half) with a bright border, that they wrote on with fabric marker and then stamped on. Quick, easy, and it allowed for some individual expression. I plan on having ours out each November for the next few years and getting Jasper to write something new that he's thankful for. I think it'll be fun to see his thoughts and his writing change over the years. So... if you're looking for a way to emphasize the "thanksgiving" part of the holiday with your kids- read on! Most of my school projects for this age (6-7) require quite a bit of prep on my part as the kids are only able to do so much. 1.Start by cutting out 16 pieces of canvas fabric. 2.Next, I got out the iron and ironed under about an inch on each of the long sides. The ends I left raw. 3. Next, I pulled out my patterned fabrics and ironed fusible interfacing to the backs of those I liked best and then hand cut those pieces into strips that were anywhere from an inch to 3/4" wide. I tried to cut them a little haphazardly so that they were uneven. 4.Then, using the iron, I ironed these strips to the sides of my runner (see pic). Cutting the strips to various lengths as I went for a fake patchwork look. 5. The final step was using my handy dandy NEW sewing machine (really this was all just an excuse to play with it a bit) and ran a straight stitch down each of the long sides about 1/2" from edge (you can switch up steps 4 and 5 and seam the edges before adding the patchwork strips so the stitching isn't as obvious). I like obvious. 6. If you want to, hand carve a few different leaf shapes. I did an oak, maple and an elm. This is where I had the fun of watching the kids get creative. Each was a little different but they had a sample that I had made to go by so they kind of new what size to make their big letters. 1. With a fabric marker have the kid write their name on the back of the runner. Then we all did "Thank You God" along the center of the runner in about 3 1/2" letters. Next, I had each child write something they were thankful for with their name if they were going to bring it home and let their siblings add their thought as well. 2. The second part of the decorating was the stamping. Each stamp is carved by me out of ez cut carving blocks. Check out my stamp carving tutorials for the how-to make these directions. We used Distress inks in straw, vintage photo, rusty hinge, and peeled paint. When you first stamp on the fabric the image is pretty faint. BUT- Add a little mist of water and you get this cool water color effect that's much darker. It's cool to talk this up as almost being magic ink to the kids. They LOVE it! I love that a couple of them started mixing the inks on the stamp to get multi colored prints like little artists. Let the ink dry and it should be permanent. Test it by dabbing it a bit with a wet cloth before laundering. Although I'd only launder these if absolutely necessary. Notes: You can use other inks, as long as they're permanent once dry. You can use Sharpies instead of fabric markers. Please do let the kids doodle all over it if they want- it's artistic expression! I worked with 3 kids at a time. It worked best with the three stamps, and I would recommend you have 3 fabric markers available as well as more then one mister. Cover the work surface as the inks if placed face down on the table, don't want to come off. Tell them to ink the stamps with the image facing up so they can tell where they applied the ink. You can also use purchased stamps. You can even used purchased place mats for the project. Just keep it easy and you'll keep it fun for them! It's been a busy few weeks- I've been to the Create-a-Thon, to Houston and back for Make it University, done a slew of volunteer work and worked like crazy here at home. I did take pics of it all so that I could show you once I had the chance to connect with you again. The main lesson of the last few weeks is that people need and love beauty. If you are an artist, it will come out in all areas of your life- from your work to your home life. Let it. Be the beauty in someone's day. Create it around you and not only will you have the enjoyment that comes from creating but others will appreciate the difference you made. Truly. At my son's school I was given the task of creating donation boxes for the warm clothing drive we did. I took a pic of the boxes because I was so pleased what a little paper and paint could do. I've been arranging baskets for the school auction- again, not anything that required a ton of talent but I was again able to put some of my creative skills to work and people really appreciate it. At the Quilt Festival in Houston I was able to teach at Make it University which is sponsored by Quilting Arts and Cloth Paper Scissors magazines. To prep for that I made over 65 card kits that turned out pretty darn adorable. They were simple to make, but the students who received them LOVED the project and were so pleased with their results. The Art2Heart group I've mentioned here had their Create-a-Thon and I was able to teach 20 some volunteers how to make my wire and fabric ornaments. Those ornaments will be for sale at their boutique in Hamel, Mn and all proceeds from their sales will go to help support the different mission organizations that they contribute to. It's been a ride for sure but so so worth all the time and work to make these things happen. People are so grateful just to have someone step up and say "I can do that" when there's a creative problem that they have. Through these activities I've rediscovered that to be an artist means so much more in the day to day world then I ever realized when I was in school. I thought it meant selling my work, making art every day, creating art to pay the bills. But I've discovered it means something more. I did a post a bit ago about how I believe artist is a personality not a job title, so I'm not going to go into that more today but I did want to show you what it's come to mean in my life. I found it means stepping up, it means saying "I can do that", it means being creative with everything from markers to paints. It means creating art for sale, for gifting, for examples, for inspiration, and for my home or wardrobe. It means being confident in my ability to create. It means connecting with my Creator whenever I do create. What does it mean to you? How does your artistic personality come out in your life? Does it leak here or there or do you embrace it with all the time and commitment and opportunity you can? Do you limit your creative nature to canvas or do you express it wherever you can? Are you known for your table scapes for the school banquet each fall, or do you decorate the church each Christmas season? Do you make cute little notes to put in your kids lunch box? How do you make your gifts available to others? Do you?